Former First Lady Nana Konadu Agyemang-Rawlings seems to have finally met her match on the dance floor. Her famous dancing skills were put to the test recently during the Royal Banquet held in Honour of His Royal Highness, the Prince of Wales and the Duchess of Cornwall at the Jubilee House. After a packed dinner – good food, music and fashion – some of the dignitaries capped the event off with some dancing. 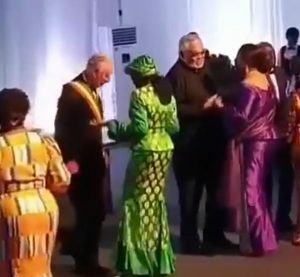 With the legendary Daddy Lumba busily dishing out some good music, the dignitaries, including President Akufo-Addo, Prince Charles (Prince of Wales), ex-President Rawlings and Nana Konadu Agyemang-Rawlings, showed off their dancing skills. 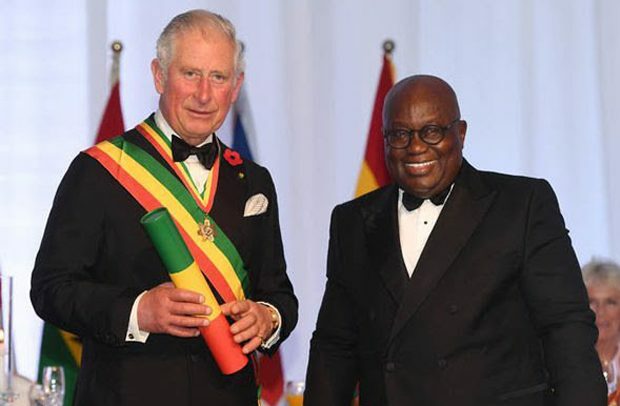 Nana Konadu came face to face with Prince Charles and yes they’ve both got some skills! With their unique dancing steps, it was difficult to select a clear winner.